Vote for a book for the 2015/2016 Book of the Year via this form. The VanDuzer Lobby will open at 6:20 p.m. The Theatre will open at 6:30. All seats are General Admission. Shortly before 7 p.m. all remaining seats will be made available for folks who do not have tickets. Update March 4: No more questions are being taken. If your question was accepted, you will have received an email telling you that you won a ticket. Do you have a question for Sherman Alexie? Submit your thoughtful question for a chance to win a ticket to see him at HSU on March 5th. Join students, faculty, staff and community members discussing the following movies. Check out Sherman Alexie on Bill Moyer's talking about his favorite films about Native Americans. Sign up online or stop by to discuss and share with others on campus. One ticket to see Sherman Alexie at Van Duzer Theatre will be given away at each Book Circle, must be present to win. The HSU Book of the Year committee is looking for writing and visual art by HSU students to celebrate the Book of the Year War Dances by Sherman Alexie. Selected visual art pieces will be displayed in the Library and the Native American Forum. Winners will also receive a course scholarship to the HSU Bookstore. 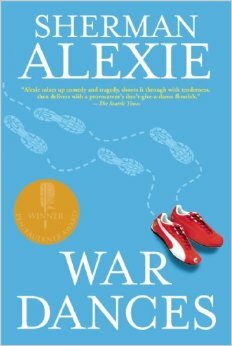 All entries must directly reference a theme, character or event in Sherman Alexie’s War Dances. All writing contest entries must be double spaced documents 12 point standard font (Cambria, Arial, etc. ), one-inch margins. Limit 5 pages maximum. Cite sources when appropriate. All entries must be anonymous and must include a cover letter (available at library.humboldt.edu/boty). Format/Medium: Only traditional two and three dimensional physical formats accepted. Unfortunately this year we will not be able to accept video, audio or other digital submissions. All visual art entries must include a cover page and an artist statement. The artist statement must be anonymous (limit 1/2 page). Plan to see Sherman Alexie in Humboldt County on March 5th. He will be at College of the Redwoods, New Performance Theater at 1 p.m.. See him at the VanDuzer Theatre at Humboldt State University at 7 p.m.
Tickets available at the HSU Ticket Office (open Monday-Friday 9-5). Do you have a favorite passage from "War Dances"? Is there a story or poem that particularly resonates with you? Are you interested in participating in a "War Dances" book circle? We are scheduling book circles on sections from "War Dances" and essays from "Sherman Alexie: Critical Essays" during January, February and March 2015. Leave a comment if you would like more information about facilitating or participating in a session. The Humboldt County Public Library also has five copies of "War Dances," check out this link to see where they are available .